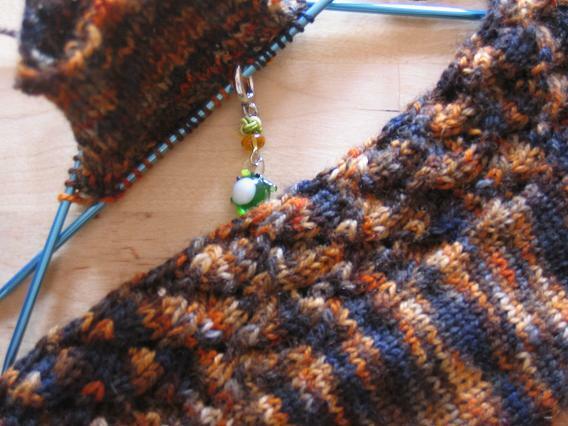 6 sts= 1" in stst, 7st= 1" in patt (gauge matched for pattern) *blocked* -- the Merino Style visibly changed gauge both in stst and patt once blocked! The Knit Picks Merino Style knit up at the exact gauge and ended up the same measurements as specified in the pattern (that originally called for Debbie Bliss double knitting cotton). I used 7 skeins-- had a bit left over, but it was definitely 7 skeins. At 2.29/@, thats an $16 sweater. Rad. (And I'm a bit shamefaced that the sweater cost less than many pairs of socks and sock yarn I have stashed...!) The pattern called for 10 skeins for the 1 year and 11 skeins for the 2 year size, I bought 11 so I have an extra 4 skeins leftover... a scarf for next winter? Or maybe a toddler vest. I used the kookaburra woolwash when I blocked the sweater, and I really like the scent. That said, I still haven't gotten around to handwashing any socks... I did have a blue tinted sinkful of water when I was blocking with the kookaburra, but it rinsed clear. Not sure if this would have happened without the kookaburra, but I don't think it'll bleed in the next wash. It did get very soft; blocking is totally necessary for establishing gauge with the Merino Style and to get a nice feel to the fabric. I also finished one Shell Sock and started another. 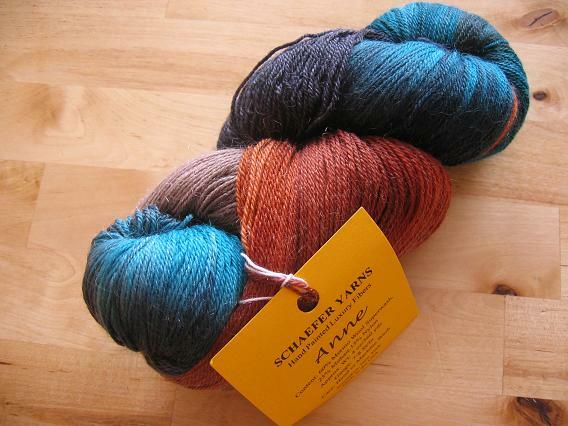 Schaefer Anne... 60% merino superwash, 25% mohair, 15% nylon. 4 oz/560yd. Sue's pics at Little Knits are truer to color than mine are. 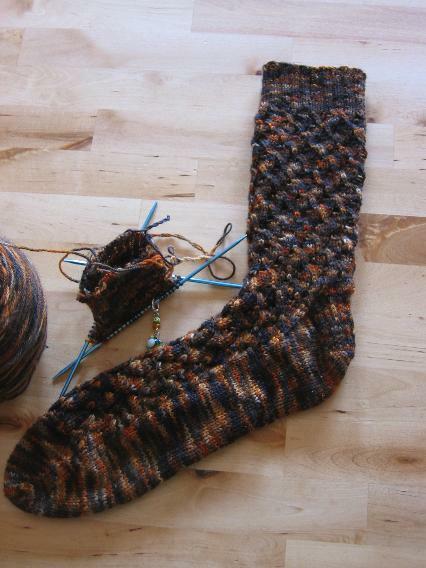 I'm planning the Dalarna stockings from Knitting on the Road for the red, and I'm planning to let the blue/orange/grey live on my desk and write me epic poetry. Wow, that sweater (and its wearer) might be the cutest thing I've ever seen. Also, great colorway for the socks. Gorgeous sweater, gorgeous lil 'un! Don't cables look different once blocked! I love cables. 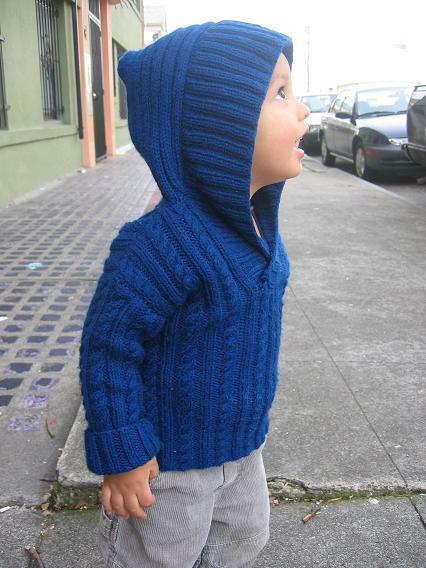 I'm making my three-year-old a hooded jacket right now that only has two cables on it and four "twists". I'll be glad when it's done - I am not enjoying this at all. Mostly the yarn, I think. I am making the 5-6 instead of 3-4 because he is tall and long in the torso. Figured he wouldn't get enough wear from 3-4 size. Looking forward to seeing more pics of Starsky progress! Oh so cute the little one in his new sweater. 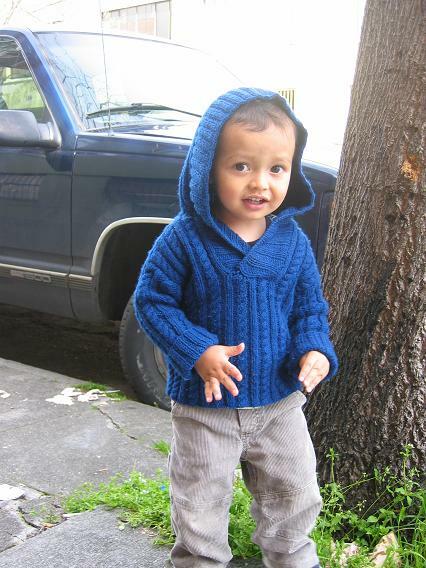 I am seriously thinking of knitting this again in a 2-year size for next winter. He looks lovely in it. The colour is really good on him. Great job on the sweater! It looks absolutely smashing on the little guy! Sweater looks so cute on him! The sweater is glorious - your little peanut is precious. The socks and the new yarns are oh so pretty. 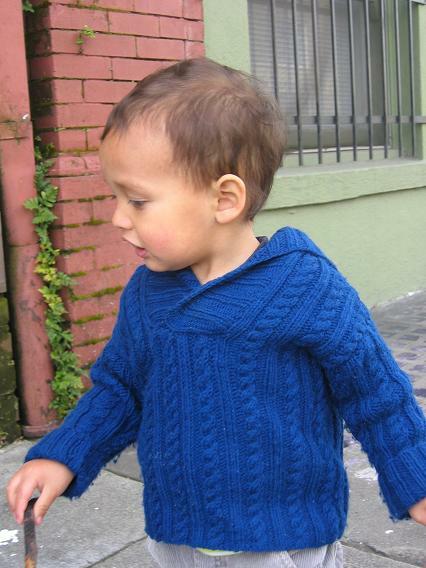 The sweater is so cute, although the little one is so darling that he would make a snotty t-shirt look adorable! 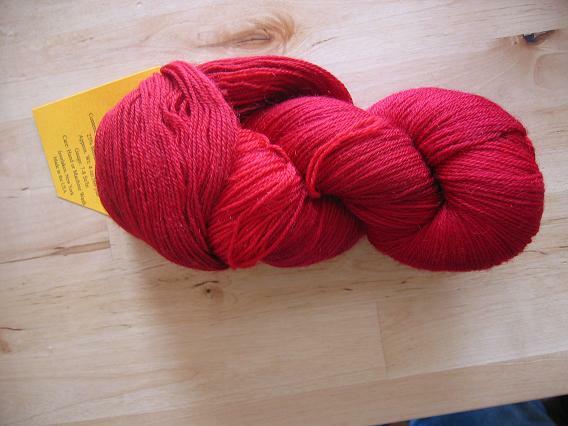 I love the color and thanks for the review of the knitpicks merino. That blue sweater is beautiful! GREAT job!